What defines a leading global city, where economic prosperity and quality of life intersect to attract the best and brightest in business and talent? Design has a critical impact on all facets of Toronto’s success; from inbound and domestic investment, to transportation, tourism, and sustainability. 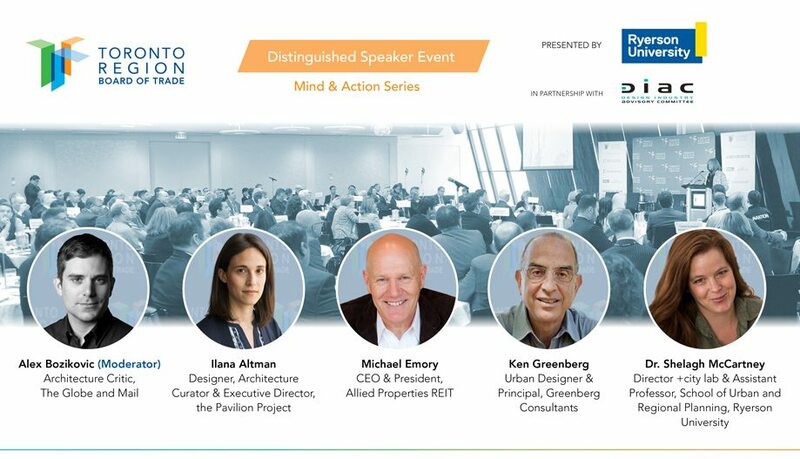 This expert panel discusses innovations in urban planning, transformative land development, and opportunities to build value through design best practices and Toronto’s leading edge built environment initiatives. Presented by the Toronto Region Board of Trade and Ryerson University, in partnership with the Design Industry Advisory Committee.